My wife and I took a recent vacation to the West Coast, starting in Seattle and then journeying to Portland where my daughter has settled down these days. Meeting her for dinner our first night in Portland presented her with a logistical challenge: I am on a low-salt, low-fat, low-sugar diet, and her boyfriend is a vegan.Where could we eat that would satisfy us both, as well as being tasty for my daughter and my wife? 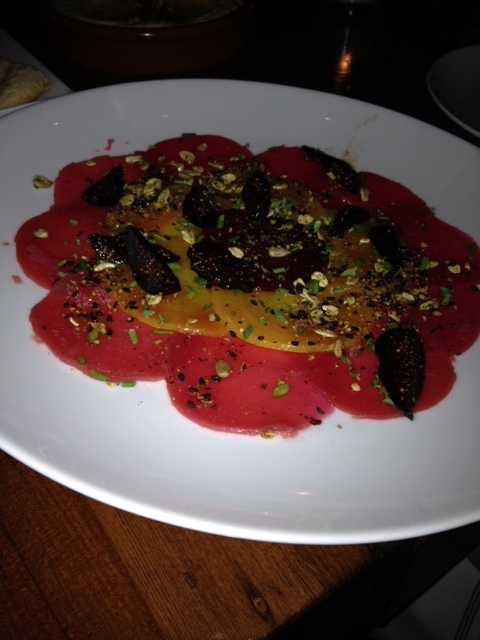 An amazing beet salad at Levant in Portland, OR. My daughter had been there before but apparently the menu had changed by the time we went with her. The four of us ended up ordering a variety of appetizers, salads and side dishes to create our own small plate extravaganza. The roasted beet salad was wonderful, with thin slices of beet and a coriander vinaigrette along with goat cheese (which I can’t eat, so we asked for the salad without it) and figs which I love, love, love. 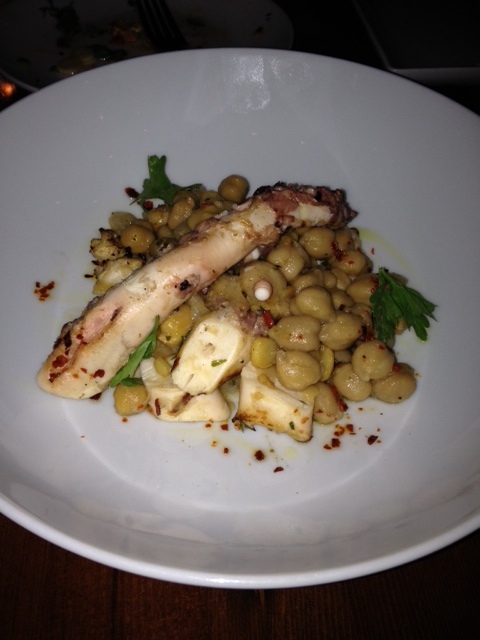 The marinated grilled octopus was a main course for me even though it’s listed as an appetizer (at $17). It comes with chickpeas, torpedo onions, preserved orange, and cilician. I’m not sure what that last item listed is, I couldn’t find reference to it online, so if you visit this place, ask them about it. Levant was pricy, but it answered our needs for a variety of dishes that were low-fat and vegan as well.